Decision at Sundown, the third of seven collaborations between Budd Boetticher and Randolph Scott, was a strange little Western. It didn’t just have its rationally blinded anti-hero seeking revenge for a rather senseless cause, and its antagonist, though he’s anything but a bad guy per se, visibly worried when the inevitable face-off occurs, it also had possibly the most comically unspectacular showdown in the history of this otherwise “macho” genre. 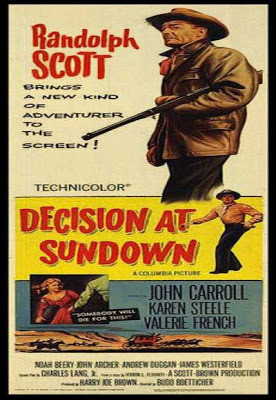 The film begins with Bart Allison (Scott), a gruff Texan riding into the prosperous town of Sundown with his amiable buddy Sam (Noah Berry Jr.) with a clear purpose. Tate Kimbrough (John Carroll), a wealthy debonair, had the temerity of having an affair with Bart’s wife while he was away, following which she committed suicide; and now Bart wants to avenge her death, and perhaps more importantly, preserve his own honour and male-ego. Ironically, Tate has finally decided to settle down, and while he’s taking his marital vows, Bart arrives in the church and announces his plans of killing him by the end of the day. What follows is an expected, but largely atypical, battle between the stubborn and borderline psychotic Bart, and Tate’s henchmen. Interestingly, their fight turns out of be the catalyst for even the town folks, who had bowed down to Tate’s position of power thus far, to finally stand up to him. And, understandably, this dramatic change of fortunes within the space of a day leaves Tate mighty bemused. 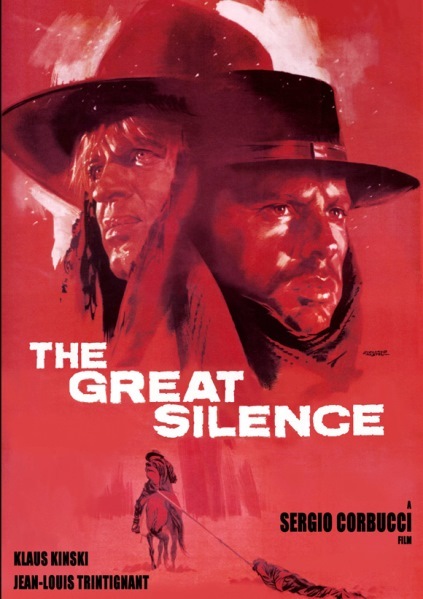 Though bereft of spectacles or grand locales, and tad too slight for a psychological Western, it does deserve a watch, if not for anything else, for its cheeky reversal of genre conventions. 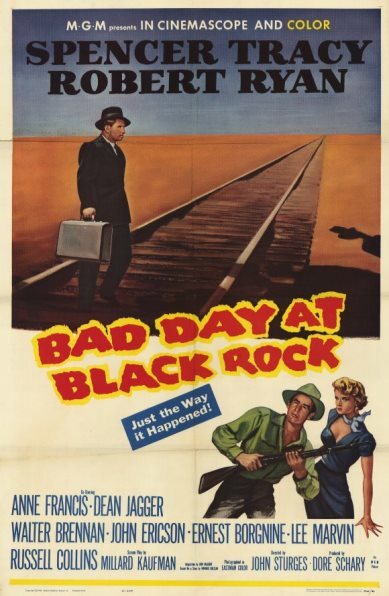 Bad Day at Black Rock was not just an incredibly tense, gripping, nail-bitingly suspenseful and feverishly paced psychological thriller, it also provided a disturbing look into xenophobia, racial prejudice and collective guilt. Consequently, though John Sturges is mostly remembered for the likes of The Magnificent Seven and The Great Escape, this largely underrated Modern Western gem might just be the smartest film he ever made. When a suavely dressed and mild-mannered one-armed stranger named John MacReedy (Spencer Tracy) arrives in the dusty one-horse town of Black Rock – the train that he arrives in makes a stop there for the first time in 4 years just to drop him – it palpably sends a wave of cold shiver through the town. What starts as visible curiosity and even impertinence, however, ends up taking the shape of open hostility and violence, as the town folks seem to be desperate to keep MacCreedy from digging up a very dark secret from their past. His nemesis turns out to be the slimy town boss Reno (Robert Ryan) and his brutish bullies (Ernest Borgnine and Lee Mervin), while his unlikely ally turns out to be the local doctor (Walter Brennan) as the rest of the folks blindly obey Reno’s diktats even when their conscience directs otherwise. The sparsely populated town, along with the grimy locales, stripped-down visuals and terse conversations, added to the mood of paranoia, suspicion, distrust and deception that dominated the film’s crisp run-time. Tracey was terrific as the seemingly amiable but essentially steel-willed protagonist, while the support cast of Ryan, Borgnine, Mervin and Brennan was also very good in their roles. Shane was, at once, a throwback to the mood and structure of Classical Westerns, and an elegy to the imminent death of the masculinity, heroism and associated lawlessness of the mythical Wild West. It’s simple storyline masked grand and poignant themes which made this an emotionally and intellectually engaging watch. 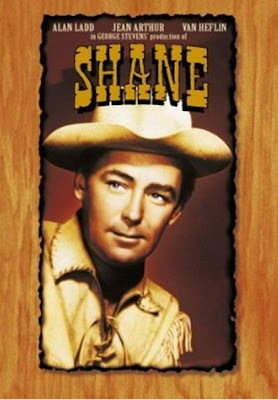 The film begins with an archetypal drifter named Shane (Alan Ladd) – a taciturn, amiable and mysterious loner – riding from out of nowhere to a tiny Wyoming town. He decides to settle down for a while with Joe Starrett (Van Heflin), a homesteader, and his family comprising of his loving wife (Jean Arthur) and young son. A power-hungry cattle baron (Emile Meyer), meanwhile, wants to drive the folks out of their lands, and even brings a menacing hired gun to add strength to his gang of bullies. But the headstrong Starrett, backed by the enigmatic Shane, form the biggest roadblock for him, and, as is the wont, a gunfight to settle scores arrives sooner than expected. Add to its underlying subtexts of Starrett’s wife developing feelings for the chivalrous Shane and his son almost hero-worshipping the gunslinger as he quite clearly represents a dying but incredibly charming breed, and the eternal conflict between capitalistic impulses and concept of communities, and you have an excellent film, even if the battle between good and evil was anything but novel or spectacular. Ladd brought into his character quiet charisma and old-fashioned charm, making it a symbol for the changing times, a theme that Ford too brilliantly captured in The Man who Shot Liberty Valence. The glorious cinematography and affecting score aptly accentuated the film’s tone. Though Sautet got his first international success with The Big Risk, Les Choses de la Vie was possibly a bigger milestone in his career. It was with this film that he came into his own as a master chronicler of the lives of the urban French bourgeoisie, and it also made him a household name among cineastes. Though he went on to make even better films on what became his pet theme, this was nonetheless a poignant, layered and understated account of a man’s dilemma vis-à-vis his emotional attachment, reflected during his moment of reckoning. 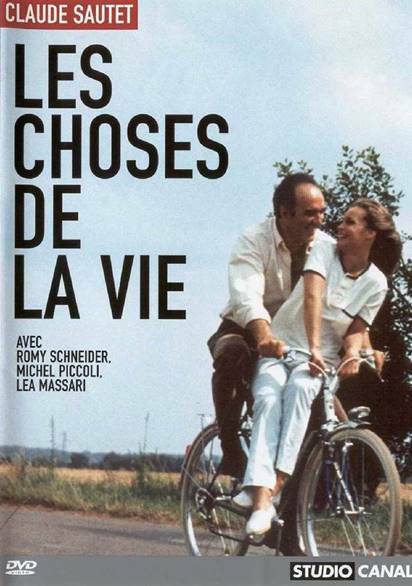 It begins with a terrible car accident and the person badly injured, as it turns out, is the protagonist – Pierre (Michel Piccoli), who, while drifting in and out of consciousness, starts recollecting episodes and fragments, both happy and sad, from his life. What emerges is that, despite his outward impassivity, he is torn between Hélène (Romy Schneider), his gorgeous fiancé with whom he presently lives, and his estranged wife Catherine (Léa Massari) and son (Gérard Lartigau) who he visits on and off. As memories of the good times he shared with his family flood through his mind, so do snippets of the small cracks that have started developing between him and Hélène. The story ended on an unresolved note, both literally and figuratively, and pun intended, which showed early in his career his proficiency at concocting memorable endings. Piccoli was good in the lead role, but Montand, who portrayed a similar scenario in Vincent, Francois, Paul & the Others, would certainly have done a better job at it. The simple, melancholic score deserves a special mention.